I'll break this review into two section, the first for those who know Cabaret Votaire, the second for those who don't. Section 1: This is brilliant, two CDs of alternate mixes, b-sides and rare tracks, divided into the "Conform" CD of their more mainstream stuff and the "Deform" CD of their more challenging and experimental stuff, and then there's a third CD of live material. Hours of music exploring all facets of the genre-defining and transcending sounds of the ground-breaking Sheffield band. Section 2: Whaddaya mean you don't know who Cabaret Voltaire are? 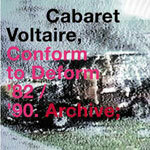 Perhaps more so than the other acts that emerged from the Industrial Records scene (Throbbing Gristle, Psychic TV, Coil, Chris & Cosey), Cabaret Voltaire influenced the new music of the 80s and 90s. They laid and broke the ground rules for electro, techno, industrial - virtually all forms of electronic music that followed them. The Orb, Chemical Brothers, Orbital - these are just some of the acts that cite CV as a direct influence, even Kraftwerk regard them as brothers. Starting to get an idea of how important they are? Well then, this 3-CD set is as good an introduction to the fabulous creativity and imagination of this band as any.